Jet Aviation has announced that Boeing Business Jets is unveiling its new BBJ 777X at the Mebaa Show in Dubai with a VIP cabin concept, designed by Jet Aviation. The Jet Aviation design dubbed Shaheen, meaning Royal White Falcon, elegantly blends modern and classic elements. The Jet Aviation Design Studio in Basel partnered with Boeing Business Jets to support the unveiling of the new globe-spanning wide-body BBJ 777X. Renderings of Jet Aviation’s stunning VIP cabin design are on display at the Boeing Business Jet MEBAA chalet. The interior is designed to accommodate 43 passengers plus a crew of 11. It features forward-thinking technologies grounded in Jet Aviation’s MRO and Completions Center capabilities and expertise, said Jet Aviation. 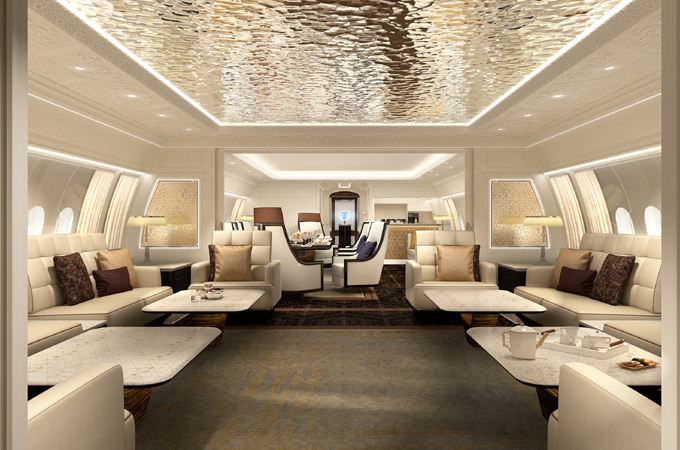 The interior concept takes advantage of the BBJ 777X’s size; featuring lounges, a game and cinema area, a stately office, private workspaces, three guest bedrooms and a master suite that includes its own lounge, luxurious bedroom, spacious dressing/bathroom area and a very large shower and hammam. “Like many contemporary homes, our design incorporates modern and traditional elements that are contrasted through the use of colours, materials and the general design intent,” explains Director of Design at the Jet Aviation Basel Completions Center, Elisabeth Harvey. “This is intensified with extremely detailed, very light ceilings and sidewall treatments with patterns and traditional panelling structures, opposing the darker wood floor which replicates the ceiling pattern with fine marquetry inlays. Light sidewall and bulkhead treatments are balanced by minimalistic but colourful furniture with delicate detailing, such as engraving inlays and floral fabric inserts. Head of Boeing Business Jets Greg Laxton expressed appreciation for Jet Aviation’s commitment to the highest design and completion standards: “Jet Aviation Basel is a very well-known and highly regarded completions center. Their interior concept for our new BBJ 777X is a compelling combination of a beautiful design and the latest technologies. “In addition to features such as weight and space optimization through fiber optics and technology-integrated furniture, we incorporated forward-thinking concepts such as intelligent, digital LED lighting throughout the cabin, as well as OLED and Smart Glass technology on all the window panels, which allows the windows to be dimmed and virtual curtains or window shades to be displayed,” says Matt Woollaston, VP Completions Sales.